1. Home Page of the WindPower program. 2. Return on investment, payback period and cost per kilowatt-hour. 3. Wind turbine power output profile including the zero-power output period. 4. Comparison with field data for a large wind turbine - the Vestas V80 2MW and V90 3MW turbines. 5. Smaller wind turbines -the Britwind (Evance) R9000, Skystream, Bergey Excel and Honeywell RT6000. 6. Comparison with field data for small wind turbines -the Skystream, Fortis Montana and the Turby VAWT. 7. Estimating mean wind speed. 8. 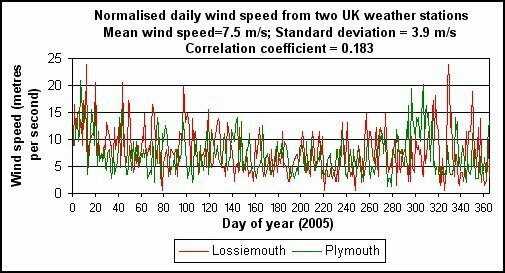 The UK Wind Speed Database program. 9. Links to manufacturers' websites. 10. Download page (see below). 12. About the project and Pelaflow Consulting. 18. Intermittency of wind power - page 1. 19. Intermittency of wind power - page 2. 18. The intermittency statistics of wind power. A specific example for the UK. In an effort to reduce our dependence on fossil fuel generated electricity, very large numbers of large wind turbines are being constructed all over the world. However, the intermittent and largely unpredictable nature of wind power has some important consequences for meeting a nation's electricity supply needs. To illustrate this, the next two webpages contains some calculations on the intermittent nature of wind power. The calculations on this page are specific to the UK and use actual wind speed records at the extremities of the country. The following web page contains a generalised analysis which can be applied to areas much larger than the UK. The figure on the right is based on a Meteorological Office wind map for the UK on the late evening of 1st April 2009. This was a period when a high pressure system extended over most of northern Europe for about a week. The wind speed figures are given in metres per second. Large commercial wind turbines have cut-in speeds usually between 3 and 4 metres/second so that it can be seen there would have been very few areas of the UK in which any significant wind power would have been generated. To quantify the matter further, data from two weather stations at Lossiemouth in Scotland and Plymouth in the south-west of England will be considered. These two weather stations are at opposite ends of the country and are 820 kilometres apart. They have slightly different mean wind speeds and standard deviations so that in order to standardise later power comparisons, the records of average daily wind speed over a three year period from 2005 to 2008 were scaled to have the same mean wind speed of 7.5 metres per second - typical of the speed at the hub height of a larger turbine - and the same ratio of the standard deviation to the mean speed of 52%. This is somewhat less than the 62% based on hourly wind speed data discussed in webpage 9 and is a consequence of the longer averaging period of a day compared to an hour. where the dashed terms u'1 and u'2 are the fluctuating components of the wind speeds at the two weather stations and the bar over their product means the average of their product. σ1 and σ2 are the standard deviations of the wind speeds. If the two records were identical, the correlation coefficient would be 1 and it would be zero if there was no relationship between them at all. For these two records, the correlation coefficient was 0.183. This is still a significant correlation and shows that scale of weather structures like low pressure regions are hundreds of kilometres across. This is self-evident from the patterns of cloud cover seen in satellite photographs of the earth and from the isobar distributions in weather maps. The Vestas 80 metre diameter 2 megawatt turbine is used in a number of offshore wind farms around the UK and will be used for our power calculations. The power curve for this turbine can be seen on webpage 4. 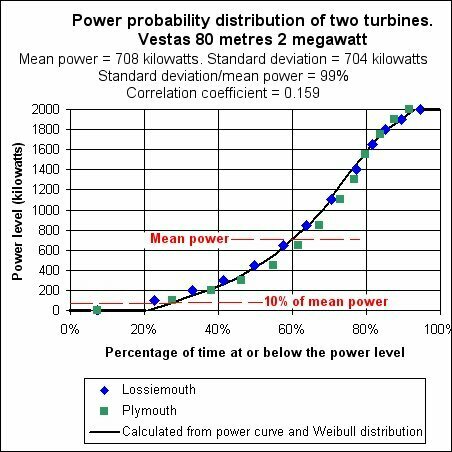 Using this power curve and the wind data for the two weather stations, the cumulative probability distribution of the power produced by such a turbine at the two weather stations has been calculated and is shown below. In addition, the distribution calculated using the power output profile option in the WindPower program (webpage 3) is also shown. 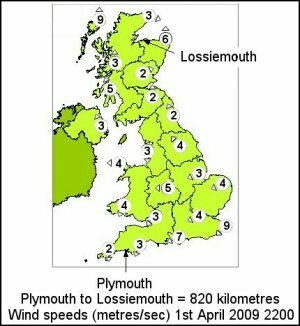 From the weather station data, the mean power produced by a 'Plymouth' turbine would be 691 kilowatts whereas the 'Lossiemouth' would produce a mean power of 726 kilowatts. The mean power calculated using a Weibull distribution with a standard deviation of 52% of the mean velocity was 732 kilowatts corresponding to a capacity factor 0.366. The small differences between the results arises from the fact that the wind speed probability density distributions for the two weather stations differ slightly from one another and also from the Weibull distribution. Nonetheless, the distributions agree quite closely and the important point for present purposes is to note the proportion of time that the turbines produce very low power outputs. The results obtained from the power curve and the Weibull distribution give a percentage time of 21% when no power at all is being produced. The results from the wind data calculations are less than this but it is certainly the case that these turbines would produce less than 10% of their mean power output for around 20% of the time. We now consider the cumulative probability distribution from the mean of the power from the two turbines. The figure below shows the distribution for this case compared with the distribution calculated for a single turbine. 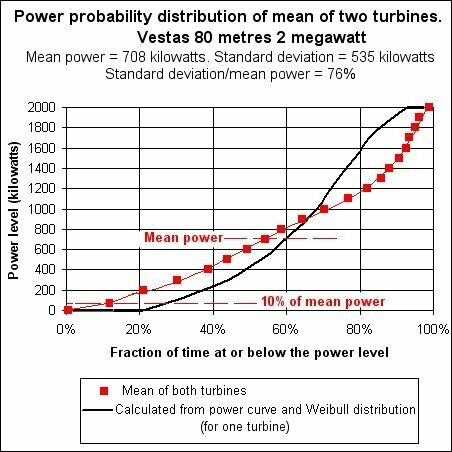 The mean power will be the same as the mean power for the two individual turbines but the standard deviation has been reduced from 99% of the mean to 76% of the mean. It should be noted that by taking examples from opposite ends of the UK, this cumulative probability distribution will not be significantly different from that produced by turbines distributed over the whole UK. The important point for the present discussion is that the period of time for which the mean turbine power is at a low level has been reduced. The data is not sufficiently accurate to be very precise but the period for which the power from the turbine combination drops below 10% of the mean power is now around 10% of the time. This is a significant number of days per year when wind power would drop to a very low level. This creates a serious problem in planning a nation's electricity supply system. In the UK, the government target is to have 30% of electricity supply by 2020 provided by renewable sources - which will effectively all be provided by wind turbines. This amounts to around 15 gigawatts of electrical power. However, for a significant number of days per year, the wind power available would fall to less than about 1 gigawatt - equivalent roughly to one conventional power station - and there will be the occasional periods when the power level will fall virtually to nothing. As a result, standby sources of power will have to be available to meet this fall in capacity. There are plans for a European grid system and, on the next webpage, the mitigating effect of this on the period of time for which wind power falls to a very low level will be considered by a purely analytic means. It is shown that even on a European or USA scale of wind power, the problem remains and the cost implications of providing standby power which will remain idle for significant periods of time will be considered. It is shown that the cost implications are less onerous than one might intuitively expect.